Today families are more likely to prepare this at home. 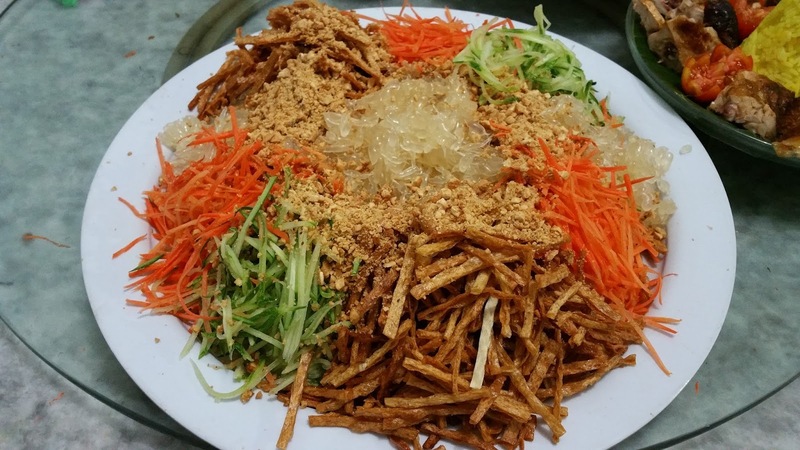 I personally prefers to have homemade Yee Sang instead of eating out, i find that most restaurants served commercial yee sang straight from the packaging instead of everything made fresh. I always experience too much packaging stuff mix in, preservative, coloring, strong smell, heavy taste and whatever that is, making the whole salad taste weird. Not to mention the salmon...it suppose to taste fresh or smoked but it taste weird. 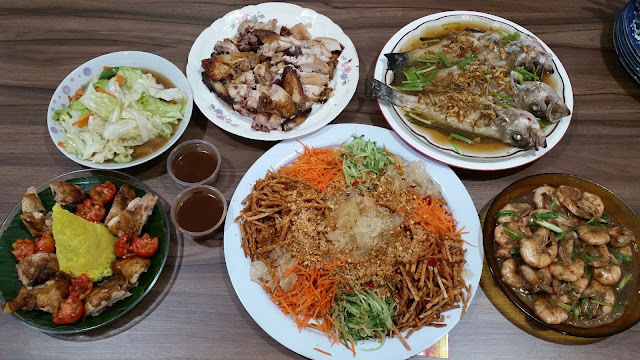 The whole dish is about the sauce, if you have a weird kind of sauce taste a little too much of everything, everything will taste weird and so complicated. 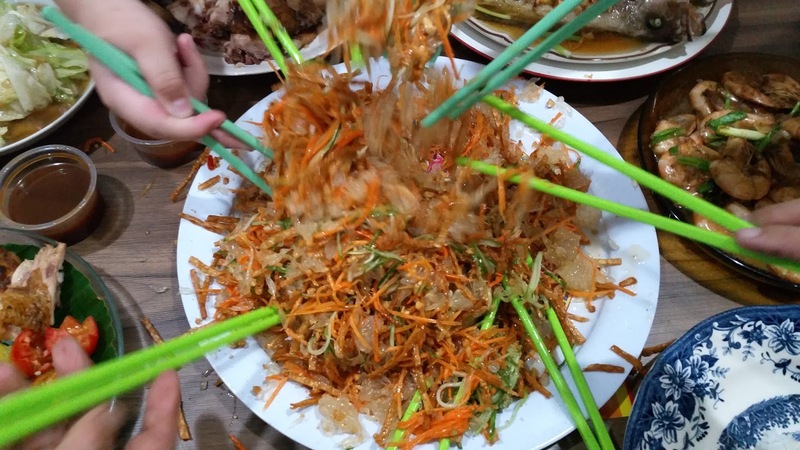 Actually Yee Sang Salad is fun and easy to prepare ourself. No complication and it is healthy, fresh and tasty too. No colorings, No preservative, everything made fresh and most of all, I teach you how to make your own Yee Sang sauce, perhaps its the most easiest you could ever imagine, after you tasted this sauce, i assure you won't go back to those packaging one. This recipe has no food coloring will be used. 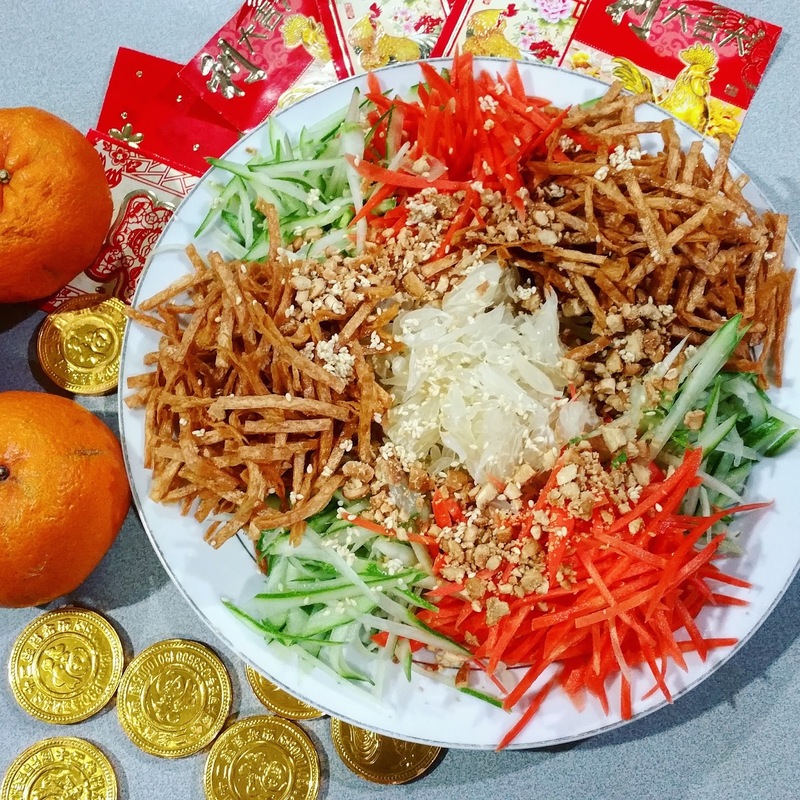 I used natural colorful vegetables like carrots, cucumbers, pamelo and fish snack, garnish with sesame seeds and ground cashew nuts. You may add a variety of colorful vegetables of your choice, like pickles ginger, red ginger, onion, cilantro, jicama/bengkuang, lettuce etc. for my version, all ingredients are easy to get work with and it is hassle free. 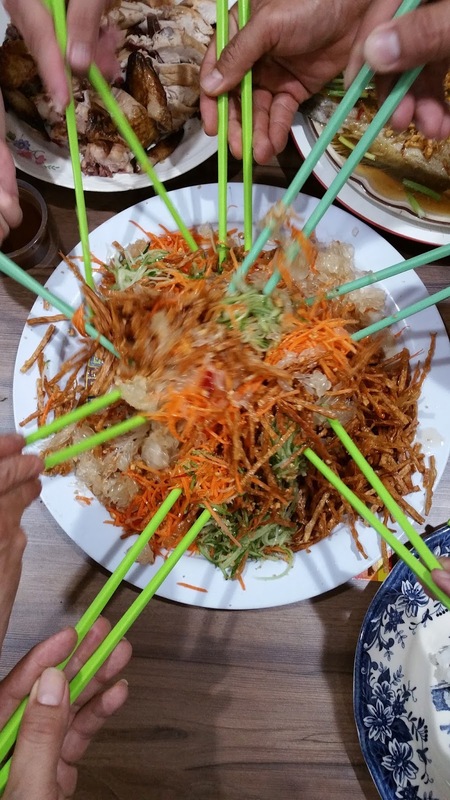 Below pic is one of my Yee Sang Salad. My shred vegetables are little too rough with knife this time...*lol sometimes i use vegetable shredder and sometimes i manually jullienned them, it is best to use vegetable shredder more fine result. I have been making this for almost 10 years, not only i make for CNY, i make whenever i feel like it as a bowl of prosperity salad. bhahaha.... too yummy. Smoked / Fresh sliced Salmon, rice crackers, wanton wrappers, japanese red pickled ginger, sliced ginger, sliced onion, lettuce, jicama, green apple, seaweeds, capsicum etc. * Heat frying-pan, whisk in sauce, let it simmer and taste, off fire, set aside. * In a serving plate, arrange all colorful vegetables according to your liking. 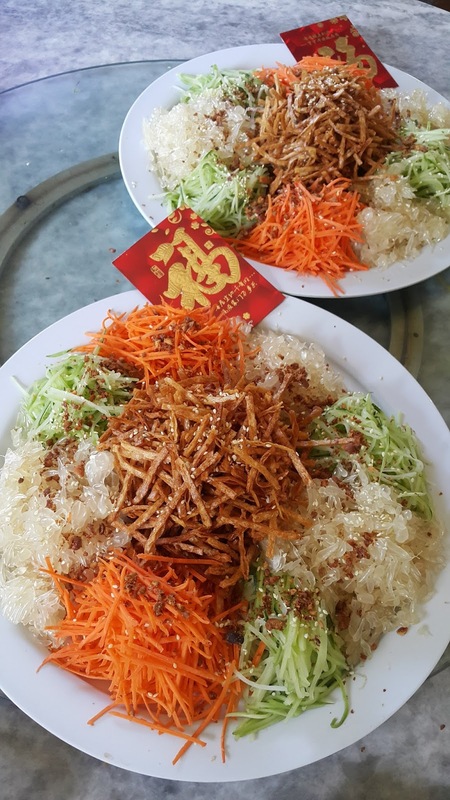 * When ready to serve, pour dressing over salad and sprinkle with toasted sesame seeds and crushed cashew nuts or peanuts.